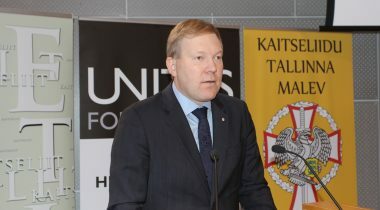 In the opening address of the conference "Estonian Security 2015: My Contribution" in Tallinn today, the Chairman of the National Defence Committee of the Riigikogu (Parliament of Estonia) Marko Mihkelson emphasised that the more aware our citizens are and the more cohesion there is in the society, the better the security of Estonia is protected against all possible modern manifestations of attack or influencing. “Modern threats to the security of countries are much more multifaceted than ever before in our history. At the same time, never before has security depended so much on each and every citizen of the state as today. Cyber space and social media alone contain a whole lot of malicious possibilities for manipulation,” Mihkelson said. Mihkelson underlined that Estonia must invest more than it has done so far into increasing the citizens’ awareness in the sphere of national defence. “The security of a country can be strengthened on the basis of its citizens in several ways. The ability to use our technological tools more safely already adds a great amount of durability to the security of the whole country,” he gave an example. “Today conflicts develop at different speeds, and all kinds of influences on information have a great role here. Open and democratic societies are certainly more vulnerable here than the authoritarian states where the control over media is not restricted,” Mihkelson said. “From the last year alone, there are many examples of how simple it has been to create sharp conflicts, unreasonable hatred and splitting in the society with the help of media space. These lessons should make us act more wisely and more preventively. Here, too, each one of us can give their contribution, because through the social media, we are all authors of a common narrative,” Mihkelson said. In Mihkelson’s opinion it is worth to consider the preparing of the information security strategy of Estonia. The purposes of such a strategy should be strengthening psychological defence and improving strategic communication. The conference “Estonian Security 2015: My Contribution” can be viewed in live broadcast.